Seventeen and having fun. The new Inspiron 17-5748 is a member of Dell's lower mid-range, multimedia laptops: Not as elegant as the XPS models, they still feature aluminum on the casing. We explain in this report why it is good for multimedia fans but barely suitable for gamers. Dell regularly refreshes its multimedia laptops. 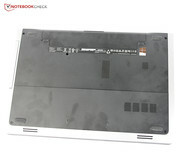 The Inspiron 17R-5737 that we tested in January is now old-hat and no longer available in Dell's shop. However, there are new models from the entry-level (3000 line), mid-range (5000 line), and models on the boundary to the premium range (7000 line). 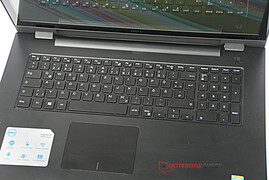 Our present review sample, Dell's Inspiron 17-5748, is a model from the 5000 line, i.e. the mid-range. 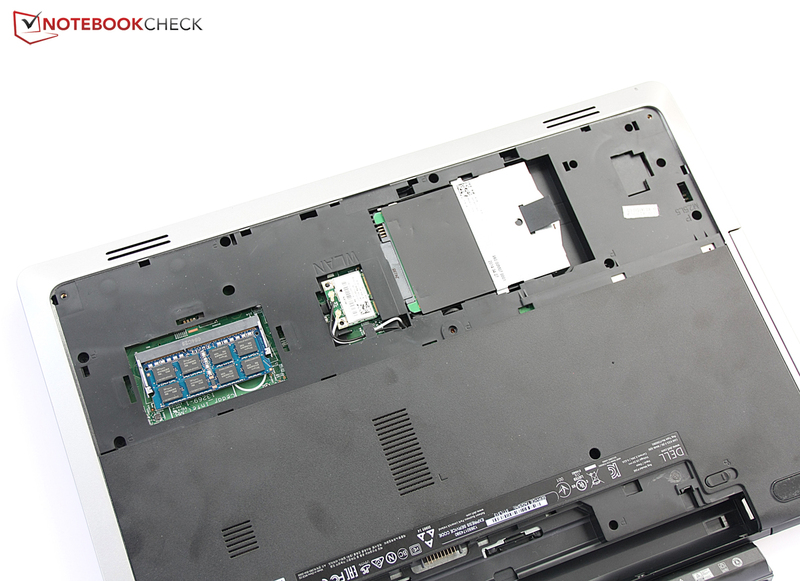 We recently tested the smaller Inspiron 15-5547 from the same range, and our verdict was good with minor drawbacks. Our Inspiron 17-5748 test configuration features a touchscreen, is powered by Intel's Core i7-4510U, and it has 1 TB storage. Unlike the Inspiron 15-5547, no dedicated graphics cards are currently available for the 17-inch models of the Inspiron 5000 line. 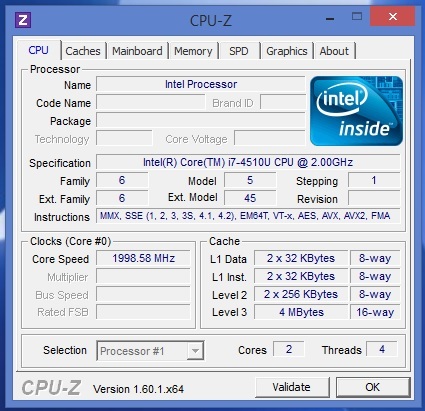 The buyer has to be satisfied with the processor-integrated Intel HD Graphics 4400. Dell's Inspiron 17-5748 is naturally not the only 17-inch multimedia laptop in this price range. It finds contenders, for example, in Acer's Aspire E1-772G, Wortmann's Terra Mobile 1749, Medion's Akoya P7631T, Asus' X750LN, HP's Pavilion 17, Toshiba's Satellite C75-A-13W, or Lenovo's IdeaPad Z710 and G710 laptops. 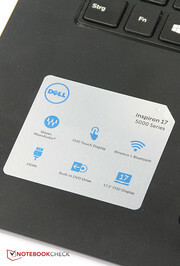 A comparison with its premium brother Inspiron 17-7737 would also be interesting. Is spending a few hundred Euros more worthwhile, or is being a bit stingy justified? The metal lid is appealing, just like the build once again. 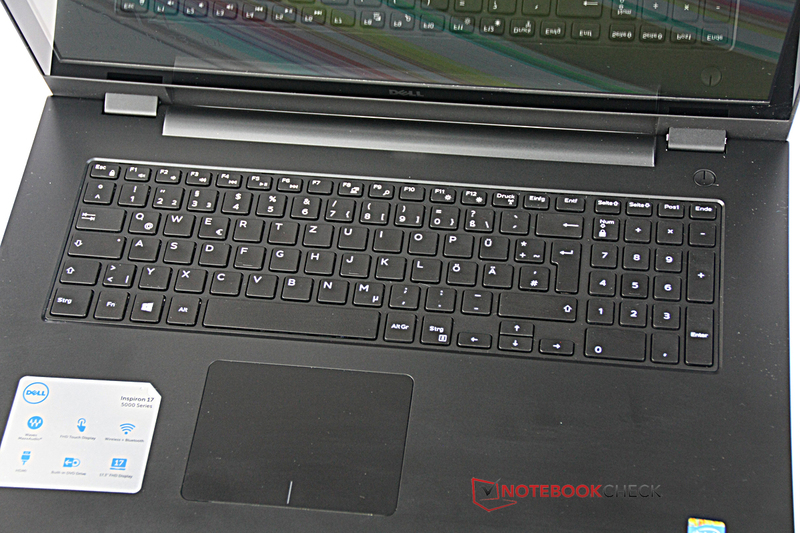 In contrast to the Inspiron 17-7737, compromises have to be made right from the outset. Unlike the completely metal chassis of the former, which even features an elegant finish, only the lid of the Inspiron 17-5748's is aluminum. 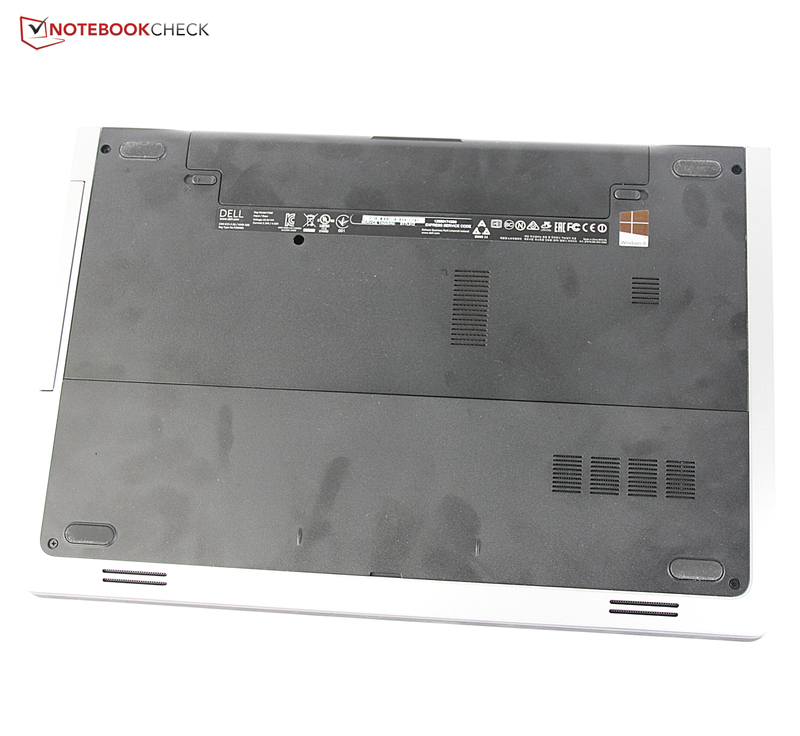 The chassis is quite similar with that of the Inspiron 15-5547, apart from its size. 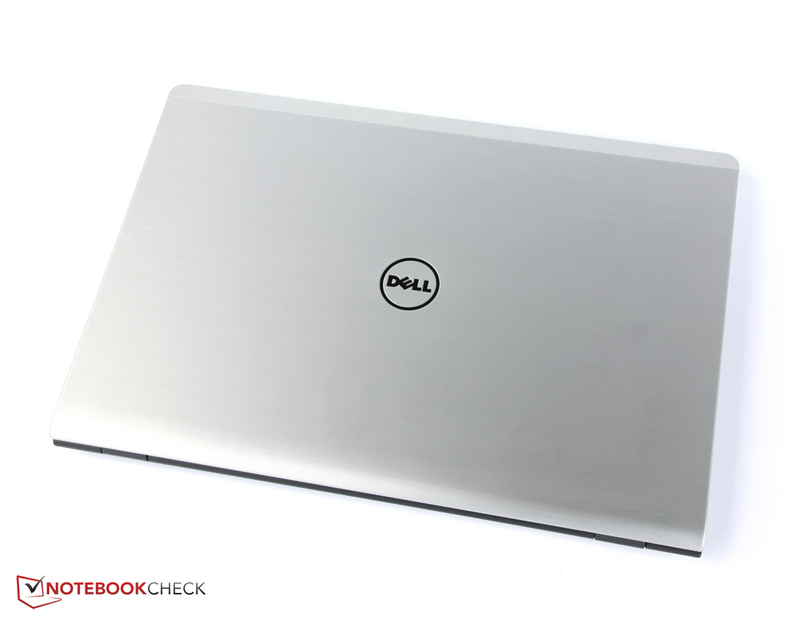 The Inspiron 17-5748 is adorned by a narrow, silver-colored plastic rim on the lid's upper edge as a little distinguishing feature, and it sets a small highlight to the otherwise brushed aluminum. Again, we very much liked the design; a restrained, yet very stylish casing made of plain black and only matte plastic is found even inside. 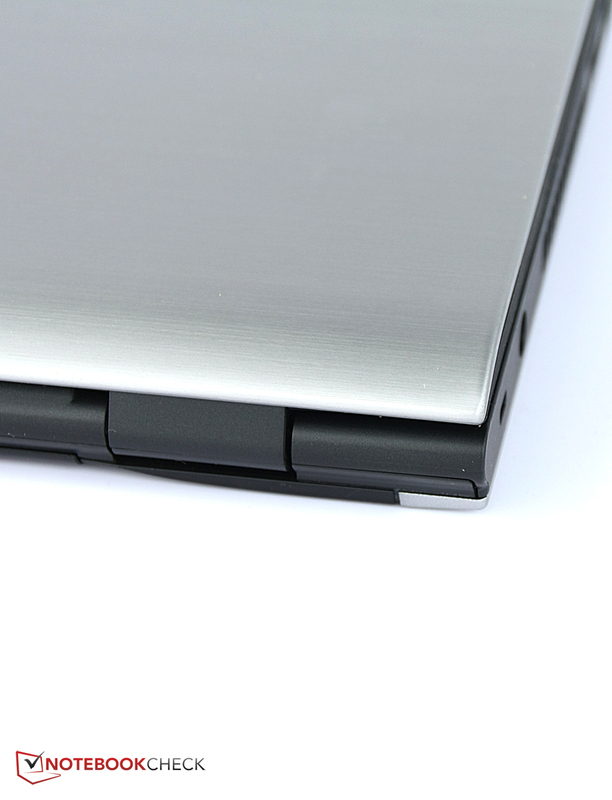 The casing feels more solid than that of the Inspiron 15-5547 and is also a bit stiffer. The display lid of our model is very bulky due to the installed touchscreen, and the chassis' height has also increased considerably because of the touch-sensitive screen. 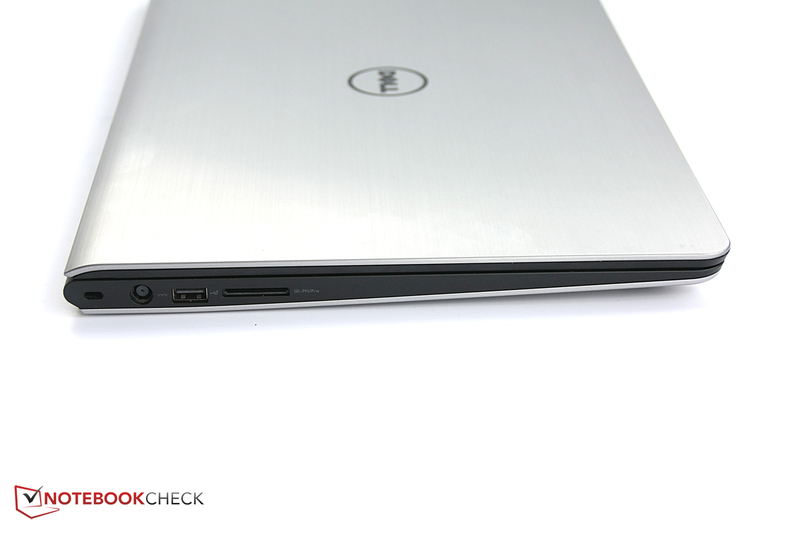 We measured a total height of 30 millimeters; Dell states a height of 25.4 millimeters without the touchscreen. Nevertheless, Dell's Inspiron 17-5748 is still somewhat thinner than many non-touch competitors, such as Asus' X750LN (31.25 millimeters) or Acer's Aspire E1-772G (34.6 millimeters). Dell's Inspiron 17-5748 is not a lightweight, with over 3 kilograms. However, both the more expensive Inspiron 17-7737 and the Aspire E1-772G weigh just as much. The Inspiron 15-5547 was not exactly a world champion in interface diversity, and its big brother that we are now testing tops that once more: Only one USB 3.0 port and two USB 2.0 ports in a 17-inch casing is clearly too little. Most contenders offer a minimum of a second USB 3.0 port. Besides that, all other 17-inch laptops feature at least a VGA port in contrast to the sole HDMI out in Dell's Inspiron 17-5748. The combo-audio jack, that combines both a microphone and headphone/speaker socket, is the sad reality among most manufacturers. 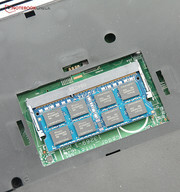 Only Toshiba offers two dedicated jacks in the Satellite C75-A-13W. The next strike is the interface positioning. Because the screen covers the rear edge, Dell could not place any ports on the rear edge because it is covered when the display is opened. Since the fan has been installed in the back left, and the DVD burner is in the back right (due to the beveled design), all interfaces are on the front sides. Cables not only interfere with opening the DVD tray, but they are also wildly distributed over the desk. We have seen this solved better, but to be fair we also have to say that a similar layout is found in virtually all compared devices. We missed a Gigabit LAN Ethernet module in the Inspiron 15-5547, and that is not available in the Inspiron 17-5748 either. The user will have to be satisfied with a data throughput of 100 Mbit per second. The smaller brother at least featured dual-band Wi-Fi in standard 802.11 ac, but the Inspiron 17-5748 cannot offer that. Only Wi-Fi in the still up-to-date 802.11 n standard is installed. The reception quality of our review sample is not as good as it was in the smaller brother. It fluctuated between 4/5 and 3/5 at a distance of ten meters and through three walls to the router. However, setting up websites was still fast. The signal dropped to 2/5 and sometimes even only 1/5 when the device and the router were separated by another wall and two more meters. The page setup was then also considerably slower. The more expensive Dell Inspiron 17-7737 at least features Gigabit Ethernet but does not have Wi-Fi standard ac, and it also had reception problems in the writer's test. Dell's Inspiron 17-5748 has a major advantage in contrast to the Inspiron 15-5547. The battery is on the outside and can be removed or replaced easily. When it is removed, the maintenance is just as uncomplicated as in the smaller brother: A few screws are simply removed, the casing's underside is taken off, and the user can access all important components. Dell offers a 12-month manufacturer warranty as standard. A technician even comes to the user's home and repairs the laptop in case of a warranty claim. The 24-month retailer warranty in some countries naturally remains unaffected by that. Buyers who want to upgrade the warranty pay 60 Euros (~$80) for every additional year, which adds up to 180 Euros (~$241) for the maximum possible 4-year warranty. The keyboard not only looks exactly the same as the one in Dell's Inspiron 15-5547, it is also just as big in terms of key size and spacing. Thus, it is the same keyboard, which is too bad because a 17-inch casing naturally has more room, and there was no need for the number pad's smaller keys or the smaller arrow keys. The chiclet keyboard is unlit and also has a few positive features. The soft stroke is certainly a matter of taste, but the user can unconditionally take delight in the keyboard's high stability that barely flexes, and the quiet typing noise ensures silent working in small rooms. The keyboard is fitted a bit tighter than in the casing of the Inspiron 15-5547 so that the typing feel is of slightly higher quality. Smaller compromises have to be made in accuracy and speed because it is not always certain whether the key has actually been pressed. The keys are simply too smooth-running for that. 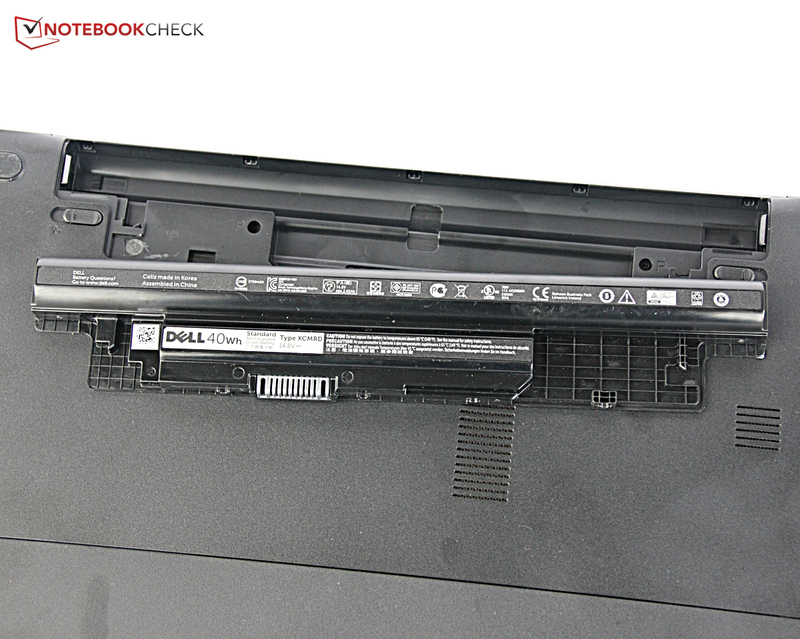 Nevertheless, it is possible to work well with the keyboard in the Inspiron 17-5748 on the whole. 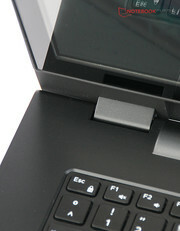 The touchpad with a 12.5-centimeter diameter is also the same model as used in the smaller brother. However, that is alright; its size was already impressive in the 15.6-inch Inspiron and is also enough for an Inspiron 17-5748 with a 17.3-inch screen. 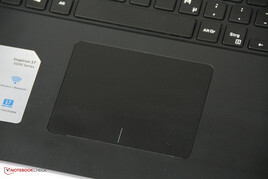 Because it is a ClickPad, the buttons are incorporated into the touch-sensitive surface. 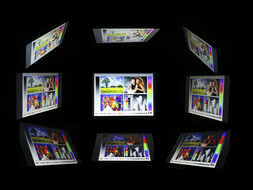 A click is performed by pressing the entire surface on either the lower left or lower right. That slightly affects the accuracy, especially drag & drop actions because the system does not always accurately detect which finger it should follow when several fingers are on the touch-sensitive surface. The plastic surface is very lightly roughened and agreeably gliding capable so that the mouse cursor can be controlled comfortably. Multi-touch gestures are also supported, and multi-finger scroll or zoom is, for example, possible. 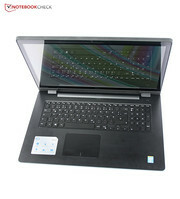 The laptop can also be used directly via the screen; the capacitive touchscreen is relatively accurate and detects inputs made with up to 10 fingers at the same time. The accuracy is maintained up into the corners. However, there are minor restrictions in the finger's gliding capability on the touchscreen. We would have wished for a sleeker surface - the surface slows down the finger particularly when pulling quickly over the screen. The screen in Dell's Inspiron 17-5748 is a TN LED screen with a resolution of 1920x1080 pixels, so the very common Full HD standard. It has a reflective surface due to the capacitive touchscreen. The non-touch screen is not matte either though. 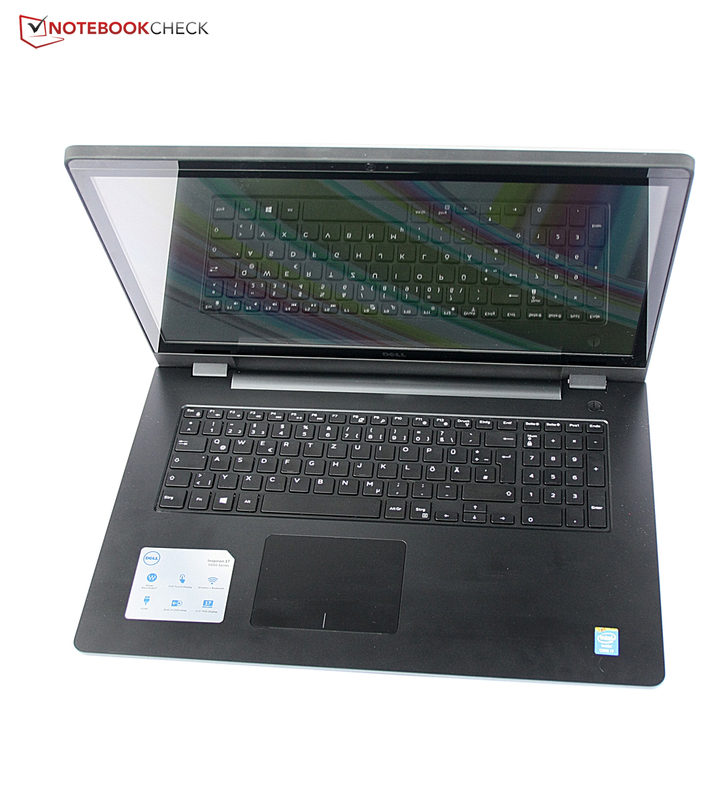 Here, Acer's E1-772G, for example, has the lead because it has a matte screen that reduces reflections. TN LED screens are quite common in this price range. 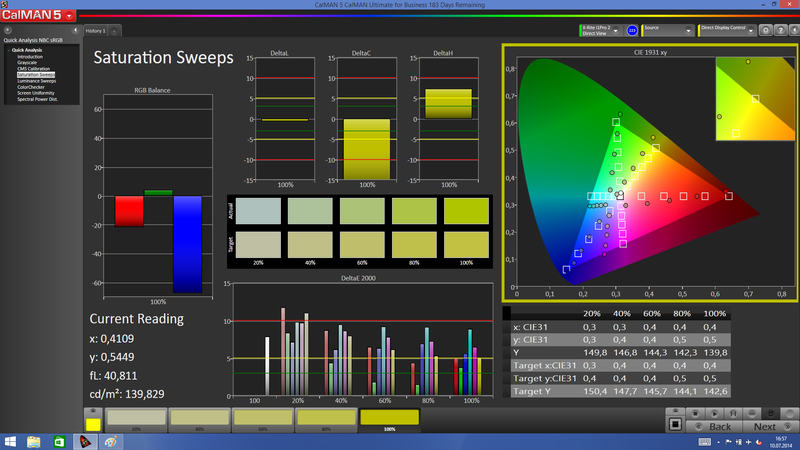 However, they also have a few drawbacks compared with IPS screens. A visible bluish cast and thus clear shifts from the ideal value of the reference color space are often evident, and the viewing angles in which the image is rendered naturally are considerably limited. At least the brightness is clearly higher than in the smaller Inspiron 15-5547. Although an average of 270.3 cd/m² does not secure Dell's Inspiron 17-5748 a top ranking in the comparison field, it is still a good rate that is in the midfield. The illumination of 91% is very homogeneous, and thus visible brightness differences on large surfaces do not develop. Both the contrast and black level are more average in the comparison field. 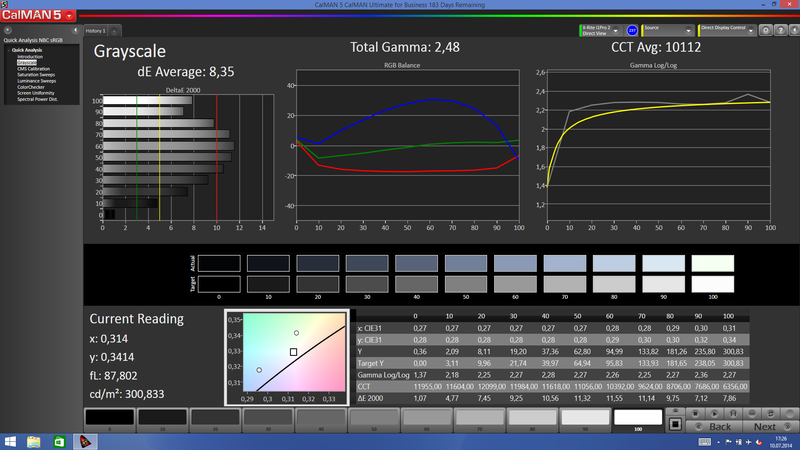 The contrast of 783:1 and black level of 0.36 cd/m² are not bad rates but are not enough for a front place. 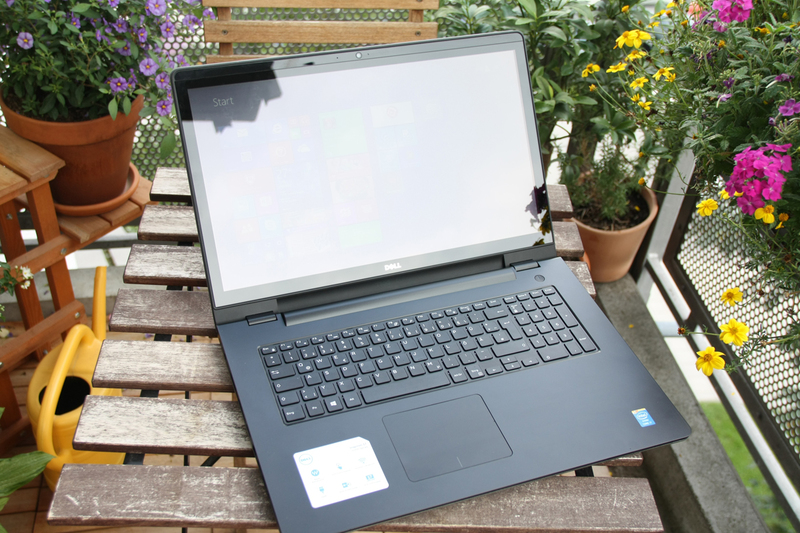 Lenovo's G710 claims this with a contrast of 1178:1 and a black level of 0.23 cd/m². Although the colors look a bit brighter than in the Inspiron 15-5547 when looking at the screen, they are overall still somewhat pale and cool. The low black level, however, lets dark colors look really deep black without a grayish cast. 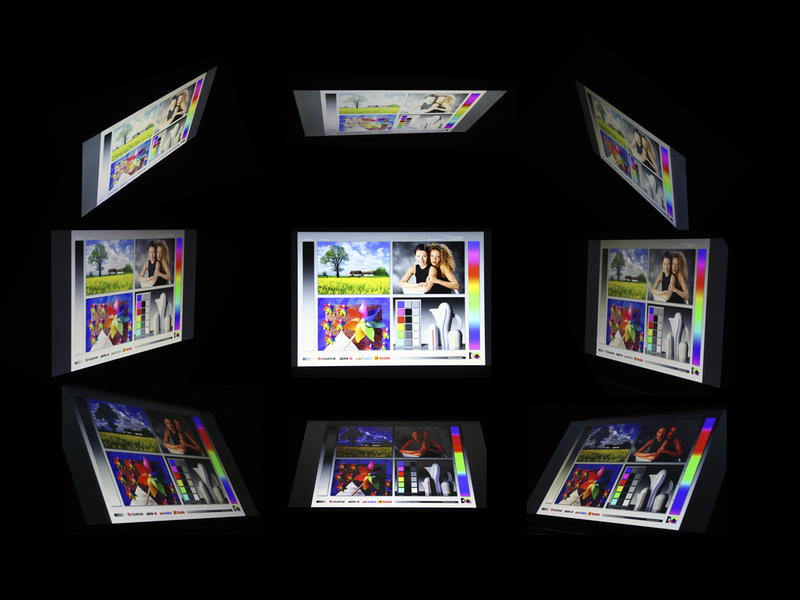 We used a photospectrometer and CalMAN software that measures the color accuracy in relation to the sRGB reference color space to receive even more accurate rates. The results are also only middling here. A bluish cast in the grayscale is evident at first glance; all colors strongly shift toward blue or blue-green and are thus rendered considerably cooler than they should actually be. 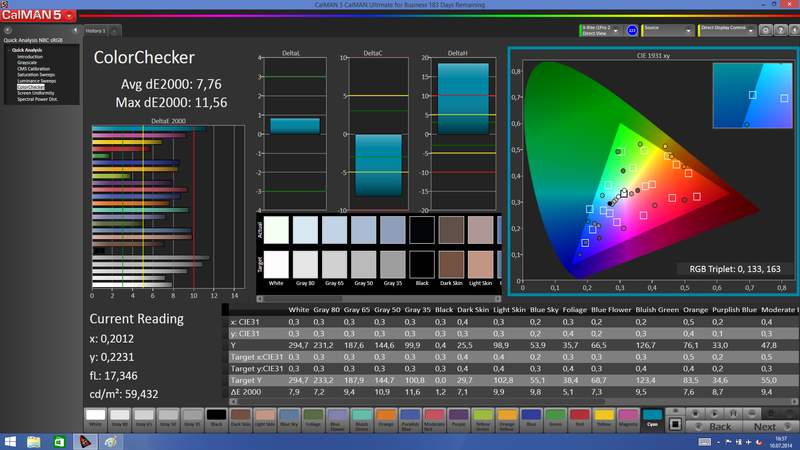 The average shift from the DeltaE reference color space is 7.76, which is only slightly worse than the average of 7.19 for all multimedia laptops. That also makes the screen useless for professional image editors or even advanced amateur photographers because it is impossible to evaluate colors in pictures accurately. The glare screen already makes it difficult to recognize content on cloudy days outdoors. Although the Inspiron 17-5748 does a better job than the Inspiron 15-5547 owing to its screen's higher brightness, outdoor use is stressful for the eyes anyway because the reflections make it hard to concentrate on the displayed content. 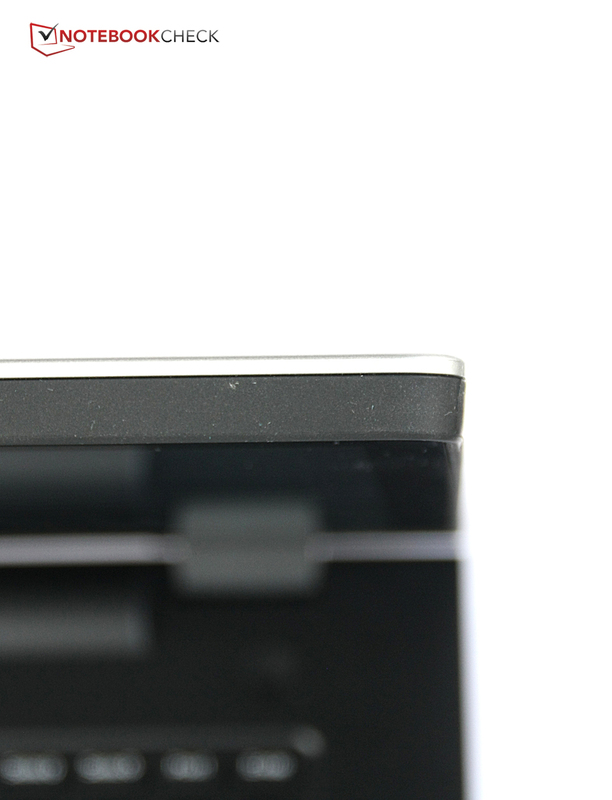 The viewing angles of our review sample are also a bit more pleasant than the Inspiron 15-5547. They are good even from fairly flat angles from the right and left. 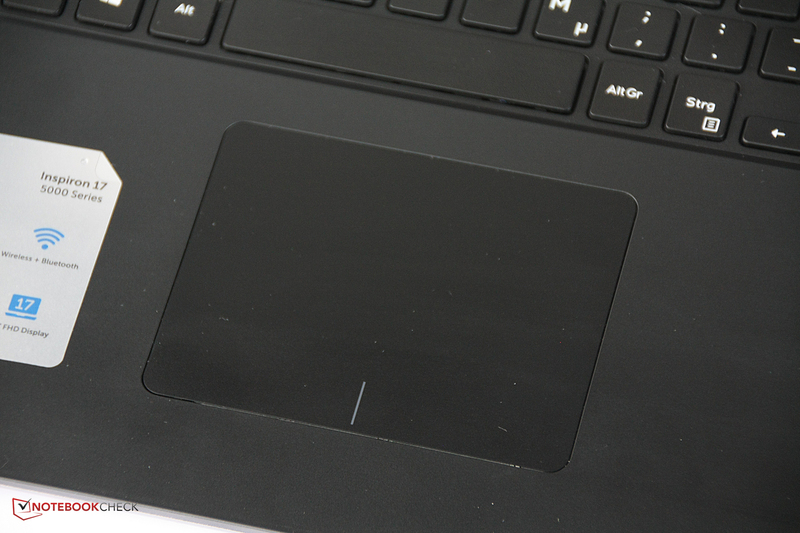 The loss of contrast is not as high from below or above as in the Inspiron 17-5748's smaller brother. Although the image distorts a bit, it remains recognizable for a considerably longer time. Dell's Inspiron 17-5748 is a mid-range multimedia laptop, and should therefore have enough power to reproduce movies in the screen's native, Full HD resolution. Multitasking and at least undemanding games should also be possible on the laptop. All routine applications, such as office programs and Internet browsers, should run smoothly on the laptop. At first glance, the Inspiron 17-5748 seems adequately equipped with an Intel Core i7-4510U with a base clock of 2 GHz and two cores. That is supported by 8 GB RAM and a hard drive with a capacity of 1 TB. Unlike all comparison devices, it does not feature a dedicated graphics card. However, the processor-integrated Intel HD Graphics 4400 is enough for fundamental tasks. The Intel Core i7-4510U processor comes from Intel's premium Core i7 consumer line and ensures a swift and stable operation. 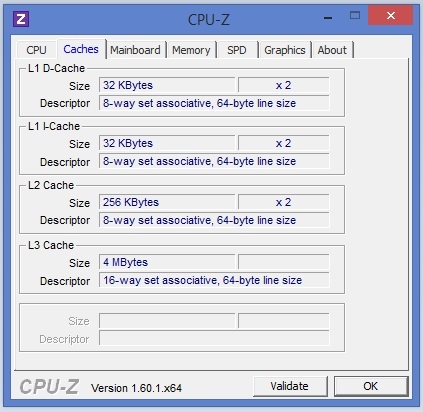 It also integrates all features like Hyper-Threading and Turbo Boost. Consequently, the two cores can process up to four tasks simultaneously, and the base clock of 2.0 GHz can be boosted up to 3.1 GHz on one active core and 2.8 GHz on two active cores. Nevertheless, the processor lags behind the majority of other comparison devices - but why? It is a low-voltage processor with a maximum power consumption of 15 watts, and though it is energy-efficient, it is also weaker than the standard processors in most of the comparison laptops. 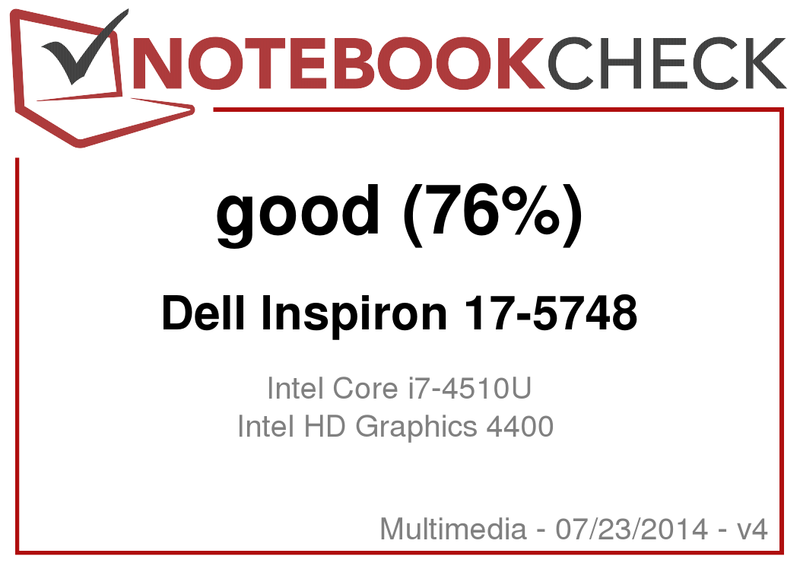 However, the somewhat lower-clocked Intel Core i7-4500U is installed in Dell's Inspiron 17-7737, which lets it fall behind our review sample. Although the performance difference should rarely be noticed in routine use, it can be said that upgrading to the more expensive Inspiron 17-7000 line for more processor power is not worthwhile. The Turbo Boost behavior is exemplary. The processor runs stably at 2.8 GHz when Cinebench R15's multi-core test was started, which is the maximum possible clock. It was slightly over 3.0 GHz in the single-core test, and thus the maximum possible clock of 3.1 GHz was not quite achieved. The clock plummeted to 1 GHz in battery mode, which saves energy and does not noticeably affect navigating in the operating system. The constant 2.8 GHz is again available as soon as multi-core test of Cinebench R15 is started - very good. On the one hand, the 8 GB working memory has an impact on the system performance. For example, Medion's Akoya P7631T only has 4 GB. The 1 TB hard drive is also a common size, and it usually spins with a slow 5400 rpm in the comparison devices as well as the review sample. 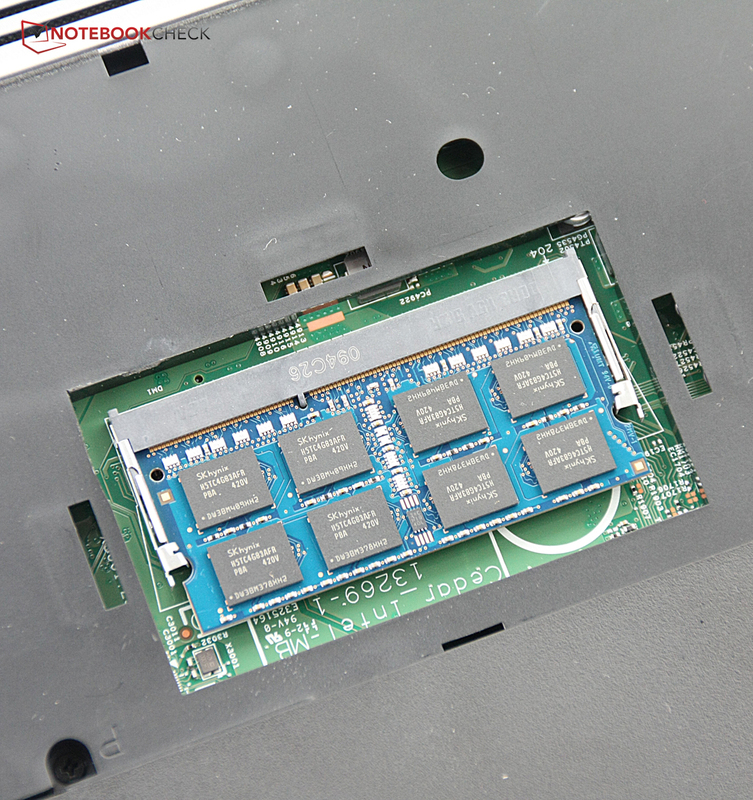 Both Lenovo's IdeaPad Z710 and Medion's Akoya P7631T stand out with a hybrid hard drive. Its flash memory is used as an extra large cache and thus increases the access speed on frequently used files. However, the graphics card is also considered, which is particularly noticed in the PCMark 8 Creativity Score because the gaming tests put a higher demand on the graphics card. The Inspiron 17-5748 without a dedicated graphics card, of course, lags furthest behind here. At the same time, it is on par with Medion's Akoya P7631T, Toshiba's Satellite C75-A-13W and Lenovo's IdeaPad Z710 in Work Score. That proves that the system has enough power for fundamental tasks such as writing documents, Internet browsing, and video conferencing. As mentioned, the hard drive with a storage capacity of 1000 GB spins with a slow 5400 revolutions per minute. It can, however, be easily exchanged after purchase. An SSD would certainly increase the system's speed considerably. 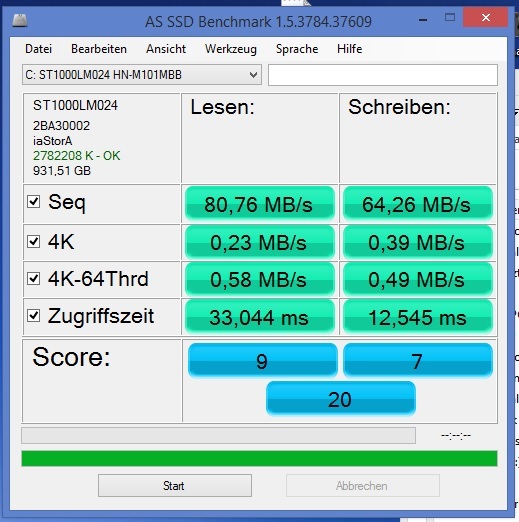 The hard drive is relatively slow; the HDD in the Inspiron 15-5547 was not a speed miracle, and it is also even much faster in almost all categories. The graphics card is integrated into the processor, which is installed in many laptops: Intel's HD Graphics 4400. It provides enough power for all routine tasks, but the user is limited to casual games or older titles in reduced resolution in gaming. All comparison devices feature dedicated graphics cards that have their own memory and significantly more power for games. The difference of even the relatively sluggish GeForce 710M in Toshiba's Satellite C75-A-13W to our review sample ranges from 28% in DirectX 10 applications (3DMark "Cloud Gate") to 107% in DirectX 9 applications (3DMark "Ice Storm"). Corresponding to the lack of a dedicated graphics card, our gaming chart is quite red, which indicates that the frame rates do not surpass 30 frames and the game is actually unplayable. The resolution and effects have to be reduced considerably even in relatively undemanding games like Diablo III in order to achieve playable frame rates. Last year's Tomb Raider can at least still be played in absolute minimum settings; however, Thief remains unplayable even in a resolution of 1024x768 and minimum effects. It might be quite worthwhile for gamers to upgrade to Dell's Inspiron 17-7737. The GeForce GT 750M makes it possible to play some current games in the screen's native resolution and high details. Examples would be GRID: Autosport or Dead Space 3. One vent on the underside was enough for Dell's Inspiron 15-5547 to cool the casing even with a dedicated graphics card. 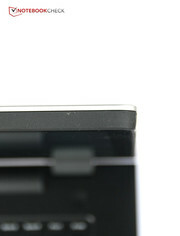 Dell has positioned the vent on the casing's left in the Inspiron 17-5748, which subjectively makes the fan considerably more audible than in its smaller brother. The fan's noise, however, does not get unpleasant although it spins unceasingly. We measured a consistent 29.7 dB(A) in idle mode, which is 0.7 dB(A) more than in Dell's Inspiron 15-5547 and is likely due to the fan's position. However, only a very sensitive ear will hear the review sample in a quiet room, although the hard drive gets more audible with 31.2 dB(A). The fan was barely heard even during full load and always remained considerably less noisy than Dell's Inspiron 15-5547. That is naturally due to the lack of a dedicated graphics card, as well as the additional room in the casing that allows for more efficient cooling. A maximum of 34.8 dB(A) is very quiet. A noticeable temperature increase in idle mode will hardly be ascertained. We measured a maximum of 28.3 °C on the underside. The device also heated up strongest on the underside during full load and reached up to 40.7 °C. Although that is felt, it is not yet an unduly high rate: Many comparison devices can reach temperatures beyond 50 °C. Additionally, the processor and graphics card in Dell's Inspiron 17-5748 will hardly ever be fully loaded simultaneously because of the lack of a dedicated graphics card, and demanding games or programs will usually not run smoothly anyway. Nevertheless, we tried to artificially simulate an absolute full load of both components in the stress test. The result: The processor clearly throttled down to 900 MHz. Thus, the power is evidently reduced; the internal temperatures remain remote from critical rates. (+) The average temperature for the upper side under maximal load is 31 °C / 88 F, compared to the average of 30.9 °C / 88 F for the devices in the class Multimedia. (+) In idle usage, the average temperature for the upper side is 25.5 °C / 78 F, compared to the device average of 30.9 °C / 88 F.
Like in the Inspiron 15-5547, the speakers are hidden under the beveled front edge. The maximum volume is okay, the speakers sound a bit richer than in the smaller brother, and the sound seems more balanced. The orchestral part makes a clear weakness of the speakers apparent when listening to Adele's "Skyfall." The playback of many instruments performing simultaneously lacks differentiation, and an audio mishmash is produced where single instruments can no longer be discerned. The Waves MaxxAudio settings can be opened via the Dell Audio program, and it offers various, preconfigured audio profiles and an equalizer. We made good experiences with the preset "Music" profile. A larger and quite bright screen alongside a strong processor: That naturally boosts the power consumption a bit. Owing to the lack of a dedicated graphics card, the full load consumption is lower than in the Inspiron 15-5547, and overall also considerably lower than in the Inspiron 17-7737. Additionally, an absolute maximum consumption of 44.1 watts is a low rate in the comparison field seen in total. With an average idle of 8.6 watts, our review sample is below equally sized comparison devices with its very low rate. It is also nice to see that the laptop does not consume any power from the outlet in a turned-off state and only a little 0.1 watts in standby mode. 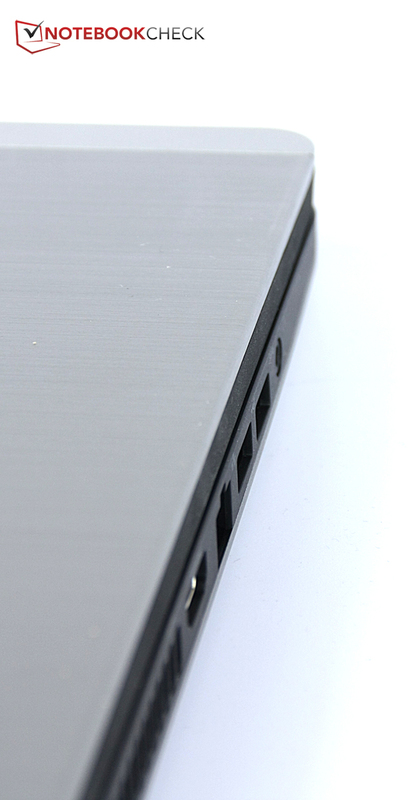 Compared with the smaller Inspiron 15-5547, our review sample has a slightly lower-capacity battery of 40 watt hours. Since the idle consumption is somewhat higher, the 17-inch laptop does not quite achieve the runtimes of its little brother. Nevertheless, 5:02 hours of Wi-Fi browsing is not a bad rate in the comparison field. It is also hardly possible to watch DVDs for 4:06 hours with another device from our comparison field either. The more expensive Inspiron 17-7737 includes a strong 58-watt-hour battery that clearly outdoes the time that can be spent on the Internet via Wi-Fi with 6:25, despite its higher consumption. Overall, the battery runtimes of the Inspiron 17-5748 are very good for a 17-inch laptop especially in the practice-relevant scenarios. 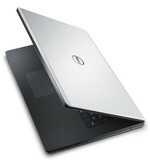 Dell primarily relies on the equation "slimmer, lighter, less power consuming" for its new Inspiron 5000 line. But is that enough? The casing's design is elegant, and the aluminum lid adds a touch of premium range; the build also makes a better impression than in the Inspiron 15-5547. Compared with the smaller brother, the screen is also considerably better although the touchscreen's reflective surface is distracting in outdoor use. However, the connectivity is lean: Few USB ports, no high-speed Wi-Fi in standard 802.11 ac, no Gigabit Ethernet. A dedicated graphics card like in most comparison devices is also not available. Admittedly, playing on a high standard is not possible with them either, but their graphics cards provide a fundamental gaming functionality that is almost completely absent in the Inspiron 17-5748. Additionally, the sluggish hard drive slows down the system, but it can be easily replaced with an SSD owing to the exemplary maintenance options. The system noise and temperature development remain within limits, and the speakers are not bad at all this time. We ascertained good rates in power consumption and runtimes, particularly in the scenarios relevant for practical use. It would certainly be worthwhile for gamers and premium-fans to look at Dell's Inspiron 17-7377. It features a quality metal casing, somewhat longer battery runtimes, and above all a dedicated mid-range graphics card that definitely makes games possible. The additional 400 Euros (~$537) has to be accepted though. Users looking for a light and slim, 17-inch laptop should stay away from the touchscreen; but a 17-inch laptop is not an extremely portable device even then. Should the graphics power not be an issue, you should definitely look at Dell's Inspiron 17-5748 with its decent input devices and the overall good total rating. The casing's metal lid is appealing. The black plastic inside also feels good. Additionally, the build is decent. Dell classifies the Inspiron 17-7548 as a mid-range, multimedia laptop. However, it lacks a dedicated graphics card. Intel's Core i7-4510U is strong and energy-efficient. The laptop's height increases considerably due to the touchscreen. The lid then looks very bulky. 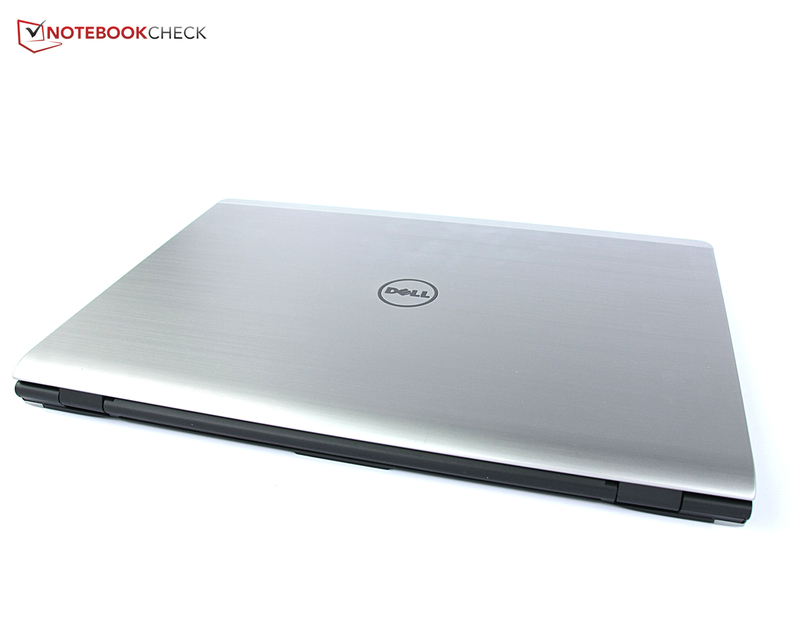 Nevertheless, Dell's Inspiron 17-5748 is slimmer than many contenders even with its touchscreen. The interface diversity is not quite satisfying. A few more USB ports would have been nice. The battery can be removed from the outside. Only two screws have to be removed to access the most important components. 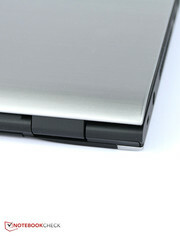 Unfortunately, there is only one hard-drive slot; some 17-inch laptops even have two slots. The Wi-Fi module can be exchanged when desired. Only one working memory module can be accessed though. Waves MaxxAudio supports the speakers' sound. The sound is quite decent on the whole. Windows 8.1 64-bit is preloaded by default. The ClickPad is not as accurate as a touchpad with buttons; overall, it is possible to work well with it. The keyboard is appealing in total, but the user will have to like the soft stroke. Dell provides a slim 17-inch laptop that operates energy efficiently, while offering a throughout high application performance. The small 40-watt-hour battery supplies decent runtimes owing to the energy-efficient processor. The improved build and the better sound compared with the Inspiron 15-5547. A swifter hard drive, more USB ports, and a dedicated graphics card! Acer Aspire E1-772G, Wortmann Terra Mobile 1749, Medion Akoya P7631T, Asus X750LN, HP Pavilion 17, Toshiba Satellite C75-A-13W, Lenovo IdeaPad Z710, Lenovo G710.